The Basilicata region of Italy is the southernmost part of Italy that is not a peninsula or an island. 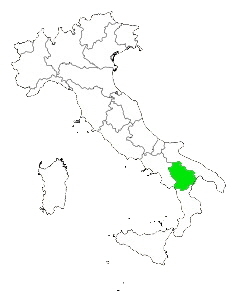 An extensive amount of the region is covered by the Apennine mountains which runs from north to the south in the center of Italy. The Basilicata region is about 3,859 sq miles has 131 towns and a population of around 559,000. The capitol city of the region is Potenza and is located a little north west of the center of the region and easy to get most places. unlikely to find yourself out in a big crowd or standing in a line trying to buy tickets. The small coastal region of Basilicata in the gulf of Taranto is sparsely populated and has more industrial settings then beach resorts however there are a few nice beach areas near the towns of Policoro, Scanzano and Metaponto. Both the towns of Policoro and Metaponto have archeological museums in them giving vacationers a little something to do besides visit the beach.